It’s pretty amazing the influential reach of Star Wars. What I mean by that is being a fan of Star Wars has turned me on to so many great books, comics, and films. If it wasn’t for Star Wars, I would never have heard of stories like “John Carter and the Princess of Mars,” or comics like “Iron Wolf” or “Star Reach,” or watched films like Fellini’s Satyricon or Woody Allen’s Sleepers. 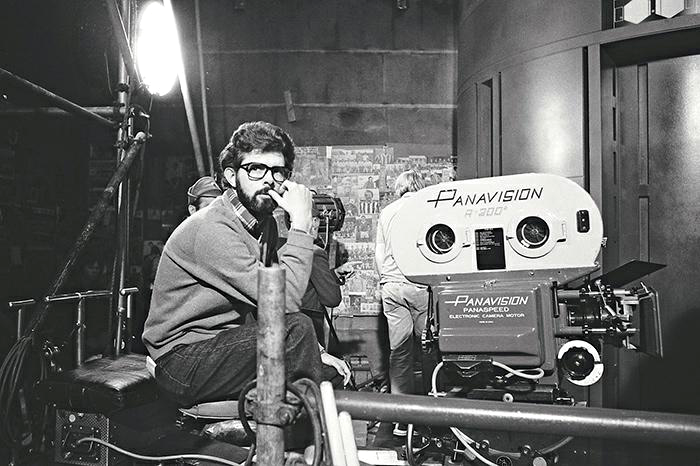 So many films are connected to the creation of Star Wars it is astounding, yet not surprising; we all know how much of a film buff George Lucas is. Certain films were referenced for their filmmaking style or the way film told the story. Japanese director Akira Kurosawa was a master at film story telling. His film style was above and beyond what anyone else was doing during the 1950s. Kurosawa’s films were epics of motion. Scenes of great battles between the farmers and the bandits in Seven Samurai were examples of film mastery. Other films were referenced based on how they looked. Films like The Dollar Trilogy, starring Clint Eastwood, were used to represent scenes on Tatooine. The rocky, barren terrain of the American West was reminiscent of the Tatooine desert. If I’m not mistaken the background scenes of the sky above Altair IV in The Forbidden Planet were exactly what Lucas did not want his planets to look like; artificial and too alien. Films like Things to Come (1936) are important because they showcased a burgeoning use of special effects that began with Georges Melies’ A Trip to the Moon. I have actually set out to buy any movie on DVD or Blu-ray that had an influence on Star Wars, whether it was for filmmaking style, a scenery reference, or effect reference. The best way to learn about Star Wars is to watch the films that influenced it. Here’s a list of some movies in my personal collection that have done that: Metropolis, Freaks, Captain Blood, King Kong, Things to Come, Buck Rogers, Flash Gordon, The Wolf Man, They Were Expendable, The Thing, The Day the Earth Stood Still, Them, The Dam Busters, Earth vs. The Flying Saucers, The Mummy, Planet of the Apes, 2001: A Space Odyssey, and Tora! Tora! Tora!. I just want to express my gratefulness to Star Wars for opening my eyes to such classic films. Each film left their mark on the film making culture and me as well. I have a new appreciation for film I never had in the past, to the point where I’m considering getting a degree in screen writing someday, once I obtain my Bachelor’s degree in Creative Writing. So many people have been bit by the creative bug once they have watched Star Wars, and I’m not any different. It’s also because of Star Wars that I went back to school to work towards a degree in writing, because I wanted to tell stories like Edgar Rice Burroughs or Leigh Brackett. Anyway that’s all I have to say right now, I just wanted to put a spotlight on some films that I believe are an important part of film history. Most of them I admit aren’t award winners, but that’s not what it’s about is it? It’s about telling a visual story and reaching out to the audience and touching them; planting the seed of creativity. Now go! Create something! If you like this blog you can also find my other blogs on thecantinacast.net and thebeardedtrio.com. And you can connect me directly on Twitter willshatter82 or @EricOnkenhout and Facebook/EricOnkenhout. Previous article Coffee and The Clone Wars: Breaking Down the Entire Series One Episode at a Time! Okay, before I even get into the meat of my comment, I have to tell you — I was absolutely THRILLED to see the photo from one of my all-time favorite films, “Captain Blood”!!! 😀 The first time I saw the Errol Flynn swashbuckling adventure — with my dad 🙂 — I was hooked. Like Star Wars, it is a movie I never get tired of watching! I, too, love the simple fact that George Lucas was inspired to spin his tale a certain way (or not to 😉 ) based on what inspired and appealed to him. And look what that has done! It has inspired fans like you to check out some of those films — and develop an appreciation for them! Not to get too deep here, 😉 but I am a firm believer in the simple truth that one can’t know where one is going without knowing first from where one came (that goes for society, too). That’s exactly the point. It’s just cool that Star Wars has lead me and others to enjoy films that I never would’ve watched if it wasn’t for star wars.